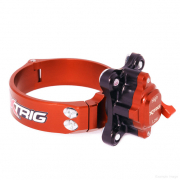 The XTrig Hi Lo Holeshot Devices ensures for a fast and safe method for the motorcycle to get the respective grip ratios out of the start gate. If you look at the various Motocross or Supercross race series around the world you will see that the performance of the riders becomes closer and closer. The lap times differ often to only a few hundredths of a second, that is why factory teams spend a lot of time and effort in the elaboration of the perfect start.